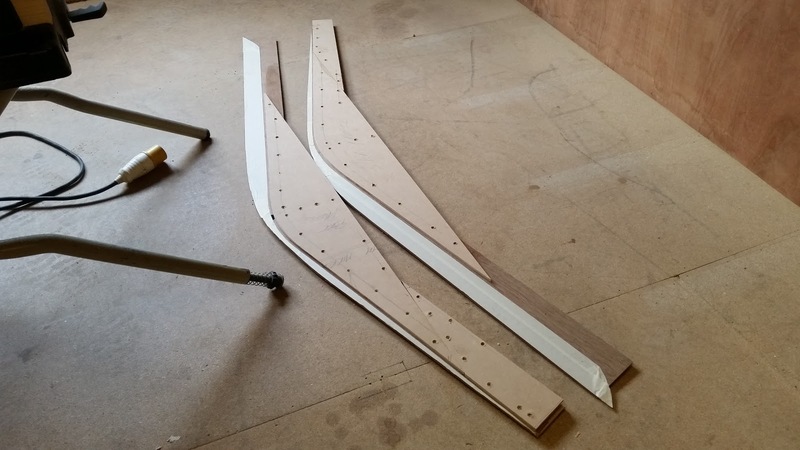 Its been a while, one thing and another has conspired to limit my resources for this project the last 12 months, that said i'm still pretty skint but what i want to get on with i have the materials for - things like ply, decorative veneer and epoxy. The insides coming along but thats a closely guarded secret which i'll reveal at some point as i don't want to post too much before i get back to where it was before i destroyed the last iteration. For an idea of what it'll look like maybe go here, here and here. Having spent a good few days in the shed doing maintanance i realised how awful the keels profile were when lit from the one working light at the time, so made this the first order of business not before building myself a new table saw courtesy of ibuildit.ca and equipping the shop with a complete set of tools and machinery largely made up of old 110V kit and a few bits bought on ebay. This way i'm completely independent of the day-to-day kit i previously had to keep removing from the van every time i worked on the boat plus i'm not putting mileage on the tools i use to make a living with. 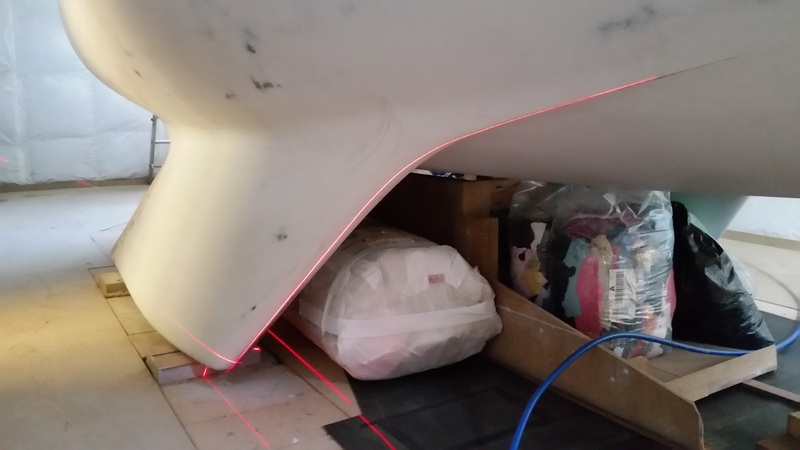 The profiling of the keels was always on the cards seeing as the gelplaner had all but iradicated any detail of that area of the hull so after sorting the trailing edge i thought it timely to consider the leading edge. 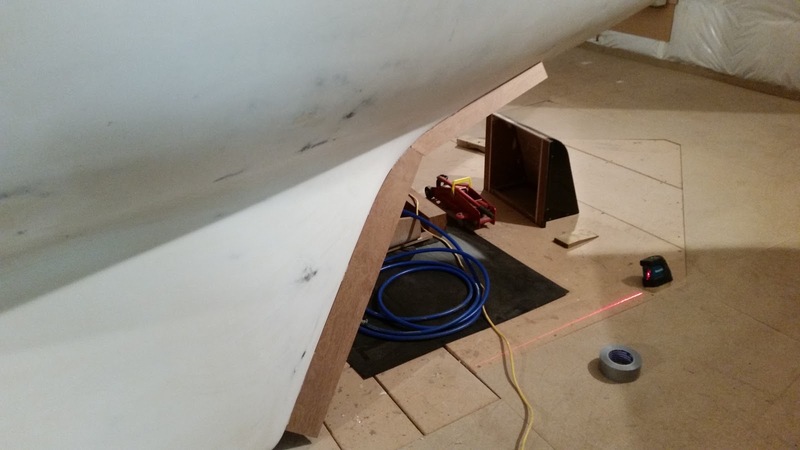 The original plan was to build up with fairing compound and shape but i know from experience putting the hull back together you end up chasing ghosts via the light and shadows cast. However while assessing what to do with three of the four flood lights in the shed dead that i saw an absolute howler on the port keels front edge. Due in no small part to me piling on the kevlar and glass i had eventually lost the original fine profile, infact the shadow cast by the one working floodlight implied my fine naca profile replaced by an almost semi-circular shape instead. This may seem excessive considering it is only a Centaur after all but they're slow enough already without putting the brakes on further with mis-shapen keels and seeing as the finer detail at the stubs top forward-most area was gone lead to the decision to sort it. 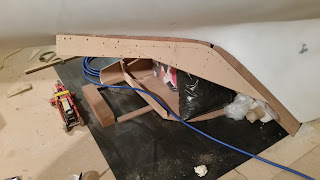 Cue hot-glue gun - bought for just four quid on ebay i can't recommend these enough for temporary or permanant bonding depending on application as this attached the ply to the boat with all checked before, during & after with the laser - another tool in the box thats proven its worth. 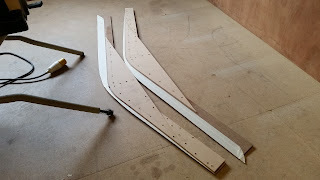 Once made i glued and screwed mdf plates either side of the ply patterns so as to hold the profiles shape. Once happy - and this is where the hot-glues properties come in - a sharp jerk of the plate and the whole assembly broke free from the hull with the glue on! So no clean up of the boat, happy days. As is the case this was the easy bit, got there though using correx and then getting super itchy routing lap joints in the glass. All done over a couple of days so a good start back, just need to sand out the lumps in the glass and cut the profile before bonding to the hull. Good to see you back on it Roger. Just looked in by chance and coughs up. Caught not coughs bloody AC.